Coping with dark corners in your house is an all-too-common occurrence. Adding a switchable light fixture can illuminate those hard-to-see areas of any home. While it may seem a bit complex to do this yourself, once you have added the first light switch fixture, any others will be much easier. Locate the proper height of the switch box by measuring other boxes in your home. Mark the height and square to size with the pencil and small square by measuring the switch box you are going to install. Locate the light fixture box on wall or ceiling and repeat the measuring and marking procedure as you did for the switch box. Cut the openings in the drywall using the keyhole saw, following just to the inside of the pencil line. You can always make the hole a little larger if the box does not fit the first time. Test-fit the boxes to the opening. Measure the openings from the outside walls and make a note of these measurements. Move to either the crawl space of your home or the attic, whichever gives you access to the wood framing directly above or below where the boxes are located. Measuring from the appropriate outside areas, mark the bottom or top stud plates. Take the ¾-inch drill auger and carefully bore a hole into the framing. Fish the 8-foot stiff wire into the hole. This wire should be bent at the top so it does not fall down the hole. Feeling around the cut box opening, grab the end of the stiff wire and pull through the box hole opening in the dry wall. Attach two runs of two-wire electrical wire to the switch box and pull through to the access area in the attic or crawl space. 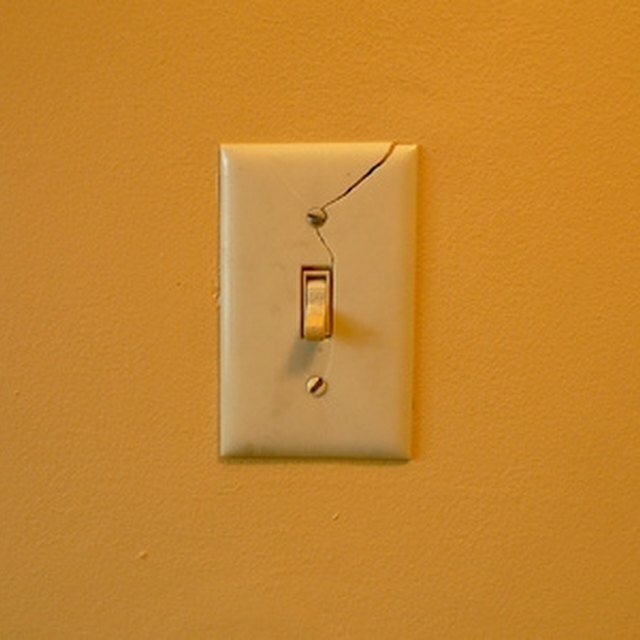 One pair of wires will go to the fixture you are going to install. The other will go to the circuit breaker box in your home. Fish the wire as you did for the switch box to the fixture box. Attach boxes with the appropriate provided drywall wing connectors that came with box for mounting. Be sure to fish the wires through the box's wire opening before mounting. Connect the wires in the following order. The light fixture will be connected black wire to black wire and white wire to white wire. Strip with the wire strippers about one inch from the end and twist together with pliers. Attach a plastic wire nut to each connection. Attach the bare copper wire to the green screw on the fixture frame. Screw the fixture to the plastic electrical box with the provided mounting screws. Realize connecting the switch will be a little different than the fixture. Strip all four wires to the same length as the fixture, about one inch. Attach both black wires to one each of the switch screws. Twist the white wires together and cover with a plastic wire connector. Twist the bare copper wires together using the wire pliers and cover with plastic wire connectors to protect the ends from shorting out against the black wires. Terminate the power feed wires to the circuit breaker box. Attach the switch plate cover over the switch and turn on the power. You should now have light in your dark corner. Follow all local and state electrical codes. You may have to receive a permit to perform certain types of electrical work in your home. If you have little or no experience working with electrical fixtures or components, call a licensed electrician to do the job for you.